Defending Vodafone Fiji FACT champions Rewa are in a tough pool after the draw was done at the Yuela Hotel in Suva last night. The Rewa football side are in Group A where they face Ba, Labasa and Dreketi while Nadi top Group B where they take on OFC Champions League semifinalist Lautoka, Suva and Tavua. The Fiji FACT tournament will be played over two weeks starting with the group stages of competition on May 11 to 13. This will be followed by the finals on May 27-28 at Ratu Cakobau Park in Nausori. Rewa Football Association president Nazeel Buksh said preparation for the tournament has been going well. Buksh said Brazilian midfielder Diego Maximo is expected to join the before the competition gets underway. 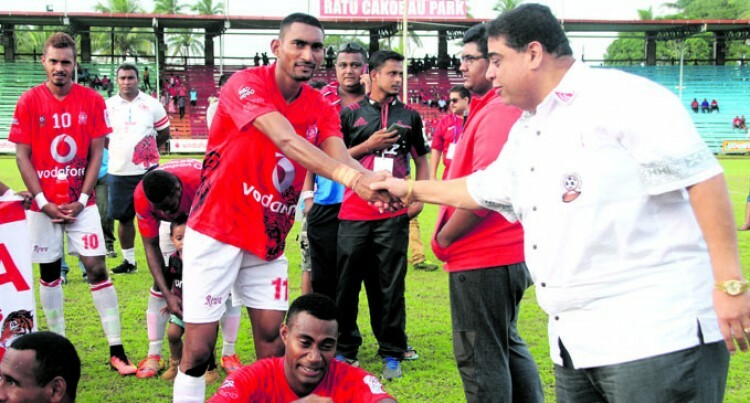 “We hope to seal the deal before the Fiji FACT competition starts next month and we are excited to have Maximo re-joining the side as he was part of the Delta Tigers during the 2016 O-League,” he said. With Maximo joining the team, Buksh says, they have high hopes that they will retain the title. “We have to win again as the finals will be played on our home ground and we want to make the people at home to celebrate. Ba and Labasa are always a force to be reckoned with whether it is the senior team, youth or junior team. They have good players and always give us a tough time. “The goalkeeper and the team will give their outmost performance and we do not want to disappoint our fans,” he added. Meanwhile, the Fiji FA Awards night continued on last night when this edition went to press.